WESTPORT — Finance board members pushed back against a plan to hire more police officers to patrol town schools, calling it a ‘massive expansion’ of the force. “I’m a little concerned about overselling the concept because I think the SRO’s do have a lot of merit and can do a lot of good, but it’s not an end-all-be-all cure for the potential for a school shooter and I think it’s important we be honest with parents about that,” Finance board member Sheri Gordon said Wednesday night. Gordon said the question was not about money but about the best way to provide security and added she’s concerned mixed data and examples from the recent shooting at a Santa Fe, TX, high school where an SRO was present, but 10 students and teachers died anyway, show SRO’s are not super-heroes. BOF Chairman Brian Stern urged caution and called on the board not to make a rushed decision. Board member Jim Westphal concurred with Stern, saying once the program is implemented it will be very difficult to undo and will cost the town millions of dollars into the future. “You’re talking about a massive expansion of the police force, which is really on a present value basis going to be tens of millions of dollars,” Westphal said. With a stated goal to prevent and protect against gun violence in Westport schools, School Superintendent Colleen Palmer asked the Board of Finance to fund the addition of three School Resource Officers (SRO’s) for the upcoming school year at a cost of $320,114. “The whole idea is an SRO is a huge preventative force, a deterrent to something happening that would harm students or staff. Not only has their presence shown someone coming to do harm may just not come at all, but the strong relationships that SRO forges with students in the building helps all kinds of information to come forward,” Palmer said at the June 7 Board of Finance meeting. Palmer presented the proposal for three SRO’s on behalf of the Board of Education, which voted 5-2 in favor of adding a SRO at a meeting in March. 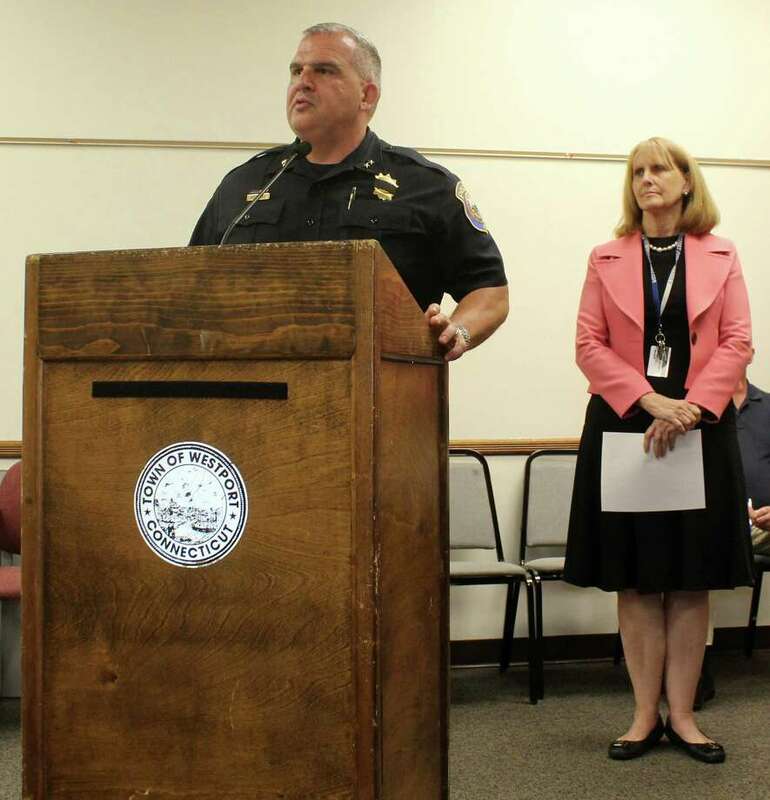 Police Chief Foti Koskinas spoke in favor of the proposal, saying the program would be a combined effort between the town’s police department and school system. Palmer, who started oversaw a SRO program as Weston’s superintendent, first proposed adding a similar program in Westport in the fall, well before the Parkland and Santa Fe shootings, she said. “I want to underscore that this is not an emotional reaction to some of the very horrific violent school shootings that have happened in the last six months, but it really was something the Board of Education began to consider well before. The recent events only highlight for me the urgency with which I’m asking us to move forward,” Palmer said, adding that each of the systems in Westport’s school reference district, which include towns such as Darien, New Canaan, and Weston, all have SRO programs already in place. Palmer’s initial recommendation called for a slow start to the program with one SRO officer for the school district who would be fully-funded from money already in the police budget for the DARE officer program, who’s curriculum Palmer said has not kept up with current needs and would thus be phased out to provide funds for an SRO. Over time, however, Palmer and the education boards’ proposal evolved to include three officers, but a funding for two SRO’s, in addition to the one SRO that would be fully-funded by DARE money, was not included in the board’s $116 million education budget for fiscal year 2018-19 that was passed by the passed by the finance board in April and the Representative Town Meeting in May. One-full time SRO would be placed at Staples High School because the internal threats tend to come from the secondary level, Palmer said, adding the other two officers would spend most of their time in each of the two middle schools but would also occasionally visit the elementary schools to do educational lessons and make connections with students so as to foster a positive image of law enforcement with students. The $320,114 price tag for the coming year would include total compensation packages for each of the two officers at $124,557 a piece, which would include not just salary, but benefits, such as pension, workers compensation, and medicare, Koskinas said. In addition, the proposal included a $70,000 one-time capital cost for police cars for the SRO’s and funds for SRO officer uniforms and equipment. In each of the following years, the annual cost for SRO’s would be about $250,000 BOF member John Hartwell pointed out, noting the capital costs for cars wouldn’t be a yearly expense. Outgoing Board of Education chair Michael Gordon said the board had not yet formulated an official proposal for where they expect the money to come from, but said the the board is looking at the reserve cafeteria fund as a potential source of funds. The official proposal will be made in advance of the BOF’s next meeting on July 11, at which it will vote on the SRO proposal. The board urged members of the public to attend its July 11 meeting to provide input on the SRO decision in advance of the board’s vote on the program on the same night.